Hibiscus plants are prized for their large and colorful blooms as well as their versatility. These attractive plants serve as ornamentals, can grow into natural hedges, and do well in containers. 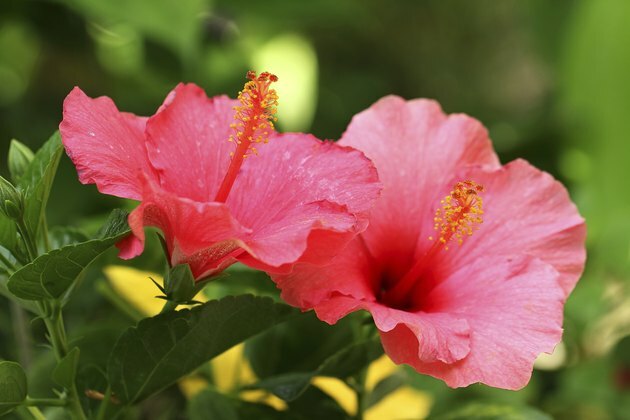 Before choosing a hibiscus plant, you need to understand the two types available to you. Tropical hibiscus (Hibiscus rosa-sinensis) is an evergreen plant that blooms year-round in United States Department of Agriculture plant hardiness zones 9 through 11. In cooler climates, you'll need to opt for hardy hibiscus (Hibiscus moscheutos). This deciduous shrub flowers from July through September and is hardy to USDA zone <ahref="http: www.missouribotanicalgarden.org="" plantfinder="" plantfinderdetails.aspx?kempercode="b492""> </ahref="http:>4. Hibiscus flowers attract hummingbirds and butterflies. Hibiscus like full sun and fertile, well-draining soil with a pH between 6.5 and 6.8. Space hibiscus plants 3 to 6 feet apart. If you are using your hibiscus as a hedge or for screening, space plants 2 to 3 feet apart to achieve a denser hedge more quickly. Dig a hole two to three times as wide and about the same depth as the plant's root ball. To protect against freezing, you can plant tropical hibiscus up to four inches deeper than they were in their nursery pot. Remove the hibiscus from the pot and put it in the middle of the hole. Backfill with garden soil halfway up the root ball and water it. After the water has drained, finish filling the hole with soil and water the plant again. Hibiscus need about 1 inch of rain or irrigation each week during the growing season. Keep the soil evenly moist rather than constantly wet. Container grown plants will need water more often than plants grown outdoors. Hibiscus enjoys high-bloom fertilizers rich in potassium and low in phosphorus. Feed established plants with a slow-release 12-4-18 granular fertilizer applied every three to four months. Hardy hibiscus need fertilizer in late spring and early summer, but discontinue fertilization during the winter months. Feed hibiscus grown in containers when moving them back outdoors in the spring. Hibiscus are sometimes plagued by aphids, thrips, scales, spider mites, and whiteflies. Apply a store-bought or homemade insecticidal soap on a cloudy day when temperatures are cool in the late afternoon. Spray the infected areas, being sure to completely saturate the plant's foliage. Repeat applications weekly, if required. If chemical controls are not desired, spray the infected areas with a strong blast of water to dislodge the pests. To keep tropical hibiscus looking their best, remove about 1/3 of the old wood each spring and cut back new growth by 1/2 inch. Trim hardy hibiscus back to 3 or 4 inches late in autumn. 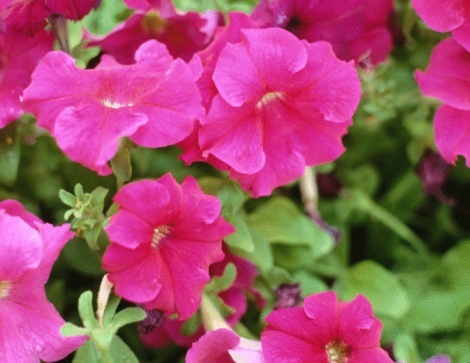 If you desire bushier plants, you can also pinch off the tips in the spring when they reach 8 and 12 inches in length. Hardy hibiscus should also be deadheaded throughout the growing season. Plants grown in containers may need pruning to maintain a desirable shape. When pruning hibiscus, cut just above a leaf rather than between nodes. Disinfect your pruning tools by wiping them with alcohol or household disinfectant when moving between plants. What Season Do Water Lilies Bloom In? Is Miracle-Gro O.K. for Hibiscus?